Bolton-le-Sands' Emma Whitaker finished second in Bath at the weekend. A promising Bolton-le-Sands pentathlete put in an impressive performance at her first event of the new year. Emma Whitaker came home second at the opening Pentathlon GB National Under 19 Ranking Competition at the University of Bath on Sunday. Bath Pentathlon Club’s Sarah Wilson took victory with Plymouth’s Annabel Denton third. Yorkshire’s Toby Price eased to victory in boys’ event. An early start to the day saw the girls begin their day in the fencing hall. With a bumper entry list of 36 for the opening selection competition of the season, it was a long battle for the girls with Isabella Summers coming out on top with 27 victories and nine defeats from her 36 bouts. City of Lancaster Triathlon’s Whitaker was 16th with 18 victories and 17 defeats. In the pool, the Bolton-le-Sands teenager was seventh in 2:24.74 as Dacorum MPC’s Samantha Farnfield led the way in a time of 2:20.62. With narrow gaps across the field the combined running and shooting discipline shook up the order dramatically. Wiltshire’s Wilson produced a superb laser run to move from 11th to first in the final discipline, crossing the line 14 seconds clear of fellow 16-year-old Whitaker who moved up from eighth. The second Under 19 Ranking Competition of the year takes place next month, also at the University of Bath, with a third Under 19 selection competition in March at the Pentathlon GB academy at Whitgift School in London. Whitaker will be hoping to build on a fine 2017 that saw here enjoy success at home and abroad. The Great Britain international claimed victory at the British Under 17 Modern Tetrathlon Championships and bronze at the British Under 19 Modern Pentathlon Championships during a fine summer spell before enjoying another success at the British Under 17 Modern Triathlon Championships. 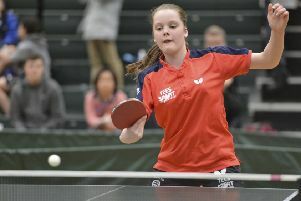 The senior events saw reigning British Champions Samantha Murray and Jamie Cooke enjoy more success on home soil.